The Galaxy Note 9 doesn’t officially launch for a couple more days, but some lucky T-Mobile pre-order customers are getting their new phone today. 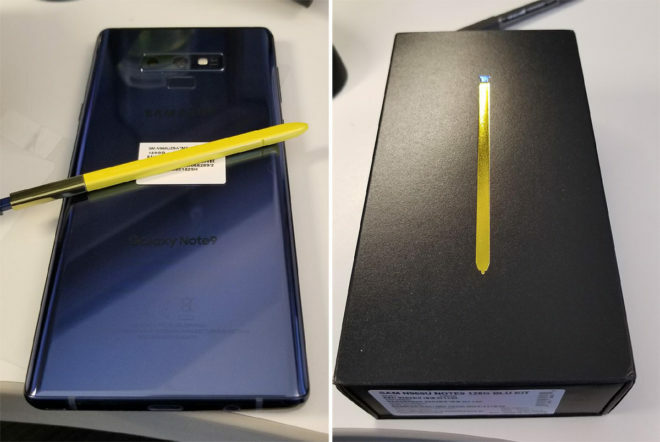 TmoNews reader Adam received his Galaxy Note 9 from UPS today, and he sent along a couple photos showing off his new piece of kit. As you can see, he chose the Ocean Blue model that comes with a yellow S Pen, and the color combo looks pretty nice. T-Mobile has a history of shipping new phones to pre-order customers ahead of their official launch dates, so it’s not surprising to see the Galaxy Note 9 hitting customers’ hands ahead of August 24th. It is still exciting, though, especially for those folks who did pre-order the Note 9 and are receiving their shiny new phone a couple of days ahead of the general launch date. Galaxy Note 9 pre-order customers, keep an eye on your tracking info, because it could be coming today. Once your Note 9 is in your hands, be sure to share your first impressions with us! Mine will be arriving tomorrow, it originally said today, but moved back a day. Just got mine…I feel like a kid in daddys candy store. I just got mine charged, and transferring data over from S9+ now. Just waiting for the screen protector to dry some. Everyone that has tracking or has already received theirs is it the 128 or 512 model and which color? Received mine today from both Samsung and T-mobile. Samsung also sent the AKG headphones along with the phone. How did you choose the gift? While making purchase on Samsung site. For phone bought from T-mobile, you have to download samsung shop app and register your phone. Mine also says the same… Expected delivery date by 8/27 (Mon). Got mine yesterday. Did the redemption for the free headphones and got them today!! It’s like Christmas!! if you pick up the note 9 from tmobile store on launch day if the give you the free headphones ??. Or do they mail it out ?? To those who have gotten theirs – did you order the 128 GB or 512? Spoke to TMO rep yesterday as I got a text stating that my shipping date had changed and I was told all the 512GB devices were delayed in inventory. New shipping date is not until 9/19-9/26 WTF?! How do you redeem the gifts? I don’t see it when I’m on the app. I tried using my iPhone. Do I need to use my note 9 for it? You need to be on your note 9. Steps to redeem the free gift (From T-Mobile CS). Though I don’t see the “Work Smarter, Play Harder” option on the Shop Samsung app. I don’t know how to redeem it. 1. Download and install the Shop Samsung app in the Google Play store. 2. Open the Shop Samsung app, tap the menu icon at top left, then select My Inbox and locate the Work Smarter, Play Harder offer. 3. Tap SEE IF I’M ELIGIBLE to get started. 4. Tap ALLOW when prompted to allow Shop Samsung to make and manage phone calls and access your contacts. 5. Tap REGISTER NOW for the Samsung Work Smarter, Play Harder Offer. 6. Tap OK when prompted to sign in to your Samsung Account to redeem the offer. 8. Fill out the required information, and if prompted, upload receipt/proof of pre-order, which can include, but is not limited to, a pre-order confirmation email, receipt, or packing slip. Registration must be completed between August 20, 2018 and September 13, 2018 at 11:59:59 p.m. ET. 9. You can check the status of your submission at https://promos.samsungpromotions.com/info/checkstatus or you can call 1-866-888-5503 for any further assistance. Full offer details and redemption instructions can be found at http://www.samsung.com/us/promotions. Anyone knows if you pick up the note 9 from tmobile store on launch day if the give you the free headphones ??. Or do they mail it out ? ?